Advantages of study in New Zealand. Study in New Zealand is an excellent choice for anyone who wishes to earn a highly valued, internationally recognised tertiary qualification. You can study everything from short trade courses to specialised, high-powered, research-based doctoral study. New Zealand has a progressive education system with state of art facilities. Qualifications are internationally recognised. 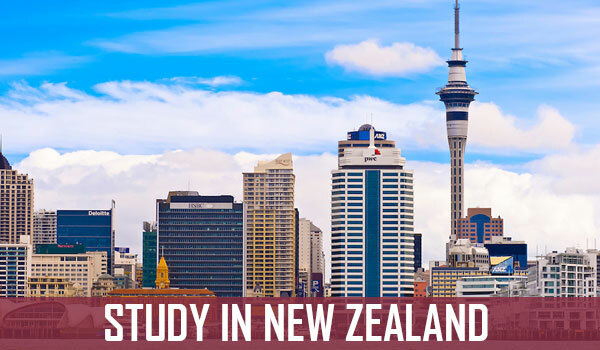 There is the wide range of opportunities like Overseas Education in New Zealand, including state administered primary, secondary schools, universities, polytechnics, colleges of education and private training establishments. The NZQA assures the quality of programme offered by state institutions and a private establishment, which in turn ensures that programmes offered in New Zealand, maintain international recognition. Most of the universities have been taking International students for the last 50 - 60 years and hence have gained a multicultural/national perspective offering a balanced curriculum which finds relevance in workplaces around the world. The same perspective enables it to offer excellent welfare services to students from around the world. The polytechnics in NZ are known for the programs which are "Ready to Enter the Job Markets". The best thing about studying in NZ is that the expenses involved are comparatively less than the other major destinations viz. USA, UK, Canada. In fact, it is almost 50% less than that of USA and UK. Coupled with the lesser costs and International recognition of its qualification, NZ essentially offers "Best of Both Worlds" qualifications. As English is the day-to-day language in NZ, Indian students find it very easy to study, live and interact in NZ. Moreover, the NZ accent is easy to understand. New Zealand enjoys temperate climate which is moderated by the sea's surrounding it. This results in mild summers and cool winters. This excellent climate encourages all sorts of outdoor sports and activities. One can indulge in sports as varied from Football, cricket to Whitewater rafting and Bungee jumping. In fact, it is widely accepted fact that NZ enjoys one of the most favourable climates in the world. It enjoys the four distinct seasons, viz, Summer (Nov. to March), Autumn (March to June), Winter(June to Sept.) & Spring( Sept. to Nov.) & hence people enjoy high-quality living conditions. New Zealand offers a safe learning environment. According to Global Peace Index (GPI), New Zealand is rated as one of the most peaceful countries in the world. It is the first country in the world to declare itself as a nuclear-free zone. The environment is green, clean and uncrowded with small populations and wide open spaces. New Zealanders are famed for their friendliness, hospitality and warmth to overseas visitors which includes International students. A code of practice that ensures the protection of international student's welfare by all education providers came into force in 2002. Only signatories to the code will be allowed to enrol international students. Ensuring that New Zealand education providers act fairly and reasonably when recruiting students, the Code gives prospective students that they can trust the institution in which they choose to enrol. Thanks a lot sharing this valuable information. Assignments are something that you can't run structure by being a student. Luckily, there is a page that provides help with your assignments and offers the important site here. It is able to help you finish your assignments successfully as well as save your time. Hope it really helps you! Wellington, the capital city of New Zealand, is house to beautiful sandy beaches which are a great getaway on weekends for students studying here. Also, the sunny weather is pleasant and welcoming. students find the city peaceful and as a great option for higher studies due to universities like the Victoria University of Wellington and Massey University. While the former one is New Zealand’s fourth entrant in the QS World University Rankings, at 275th as of the 2014/15 edition, the latter one is ranked 346th in the QS World University Rankings 2014/15. And, the Victoria University of Wellington is famous for its courses in law, science and humanity amongst several other courses.